As Tiny Texas Houses transitions into building out the Salvage Texas market and venue space, we are offering a unique investment opportunity and the chance for you to own our original Tiny Texas Houses. We have only two Tiny Texas Houses still available for investment- The Loopholer and The Retreat, and both are still under construction. For the investment plan on these two houses, the cost of finishing construction is factored into the purchase price. Once the houses are complete (est. Summer 2018) investors will make a 10% annual return (paid quarterly) on your investment over 10 years. At the end of the ten year term, you have the freedom to move the tiny house off the property or re-negotiate terms to keep it at Salvage Texas. So for example – if you buy The Loopholer at $40,000, we will pay you $4,000 a year for 10 years. You will own the house and it will be in your name (we provide a bill of sale). During the length of the ten years, Salvage Texas will cover all the maintenance cost and upkeep of the house while it gets used as overnight lodging. Investors will also be given one full month every calendar year to utilize your tiny house as a vacation home or rental. If you are interested in investing and would like to learn more, please email us. The Loopholer is a new 10’x12′ house currently under construction in Manifestation Bay and was built by a group of students during the Loopholer Building Workshop. The finished design plan includes sleeping space, small kitchenette, and possible bathroom space – all cleverly disguised to take advantage of the loopholes in current building code. Please contact us for The Loopholer’s current price. This price includes the calculated cost of us finishing the construction (est. 3 months) and getting it operational as one of our overnight lodging options. The Red Log Cabin- SOLD! The Red Log Cabin is a new house currently under construction in Manifestation Bay at Tiny Texas Houses. The finished design plan includes a front porch, kitchenette, and bathroom addition. The Red Log Cabin has 100 sq. ft. downstairs footprint with the same amount of space in the loft. The materials for the Red Log Cabin came from the Salvage Mining Workshop we held in Weatherford Texas where we took down an old log cabin on a family ranch. Q: Will I own the house? A: Yes! We provide a bill of sale, and the house is officially in your name. After 10 years, you are free to move the house out of Salvage Texas or re-negotiate a plan to keep it at Salvage Texas and make money on it as overnight lodging. Q: Wait, I can OWN a tiny house and immediately make money on it? Is that true!? A: YES! This is the only tiny house investment plan of its kind in the nation. We are sitting on a 100,000 sq. ft. warehouse full of materials and plan to build many more houses next year. This investment plan was setup to help grow Salvage Texas, and we have a bunch of exciting plans to make it one of the coolest places in Texas. There is no savings account that will get you 10% return on your investment yearly, it really is a sweet deal. Q: Who covers maintenance and insurance? 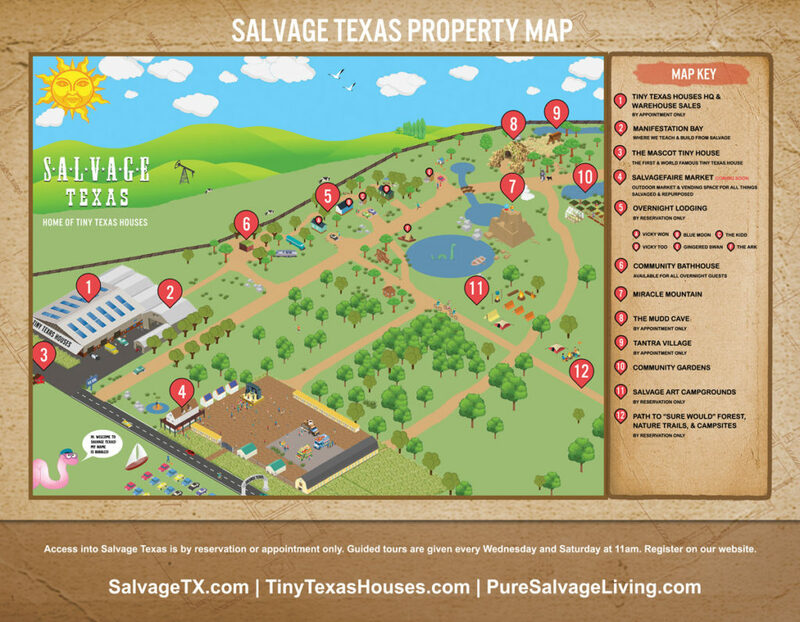 A: Salvage Texas is covering all maintenance and upkeep costs for the tiny houses over the ten year period as it gets used for overnight lodging. If you want insurance on the structure itself, you will have to do that in your name. Q: What about the property it sits on? A: The 5 acre land that the tiny house village and all the houses sit on is paid off free and clear. Q: Can I divide up how I want to use my 30 days? A: Absolutely! We are open to working with each investor to accommodate you. To us, you are investing in our vision at Salvage Texas and practically family, so we want to make sure you get to use your house and enjoy the fruits of this place. Q: Is the contract and sales process long? How long to close? A: We have made this investment very easy and straight forward. We have a contract spelling out the terms, we provide a bill of sale, and you are all set. As soon as the house is paid in full, it is yours and will begin pulling in your 10% return. We have closed investments for the other tiny house in as little as a week.